How does noise affect teachers and children during a school day? In Tiesler, Machner, and Brokmann’s paper “Classroom Acoustics and Impact on Health and Social Behavior” (2015) they examine this question empirically and conclude that a significant relation between acoustic conditions and both social and health-related problems in classrooms exists. How does noise affect teachers and children in their everyday life at a school? We all know that schools, together with many other public places in our society, generally are noisy environments. We also know that schools only rarely have the resources to change these environments by other means than attempting to change the behaviour of the children. This leads to the realization that schools are noisy, often very noisy. In Gerhart Tiesler, Rainer Machner, and Holger Brokmann’s presentation “Classroom Acoustics and Impact on Health and Social Behaviour” (2015) at the 6th International Building Physics Conference, they set out to explain just how acoustics in schools work and how it affects both health and sociality. They did so by analysing data from a project carried out by the Institute of Interdisciplinary School Research at the University of Bremen where they, during a 6-year period, monitored education, noise levels, and other variables in different schools. From this data, they point out a series of interesting correlations between acoustic environment, noise, and behavioural effects. The first question which should be raised in an examination of noise and its effects is ‘what is noise?’. Tiesler et al. define it as such: “Noise is more than an SPL [Sound Pressure Level – how loud a sound is] measured in Decibel – it’s the result of an acoustic perception and cognitive process” (Tiesler et al., p. 3109). As such the article acknowledges something important in the study of sound and acoustics. Noise isn’t just a decibel level describing the loudness or pressure of a sound. Noise is sensitive to context. As such, an extremely loud sound can be noisy or beautiful depending on the mind that interprets it. We can’t just measure noise in purely technical terms; we also need to examine how people react and relate to a sound to determine whether it is noise. With this in mind, Tiesler et al. can suggest criteria for examining noise in classrooms. 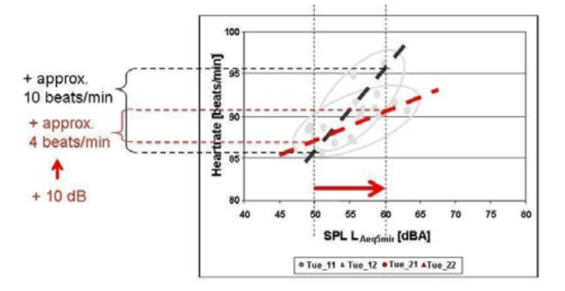 The first criterion is heart rate since heart rate generally correlates with SPL, no matter how we understand or emotionally relate to a sound. 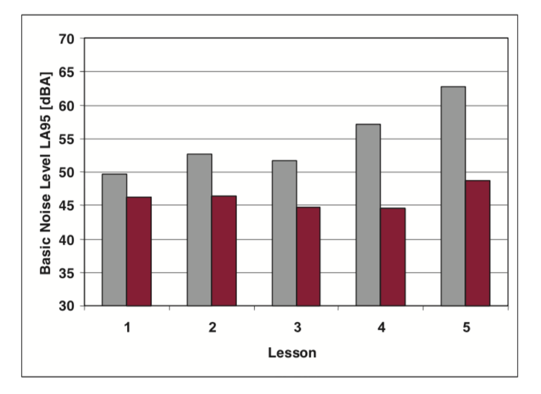 Based on this, they analysed the example of a school class that had bad acoustics one week and very good acoustics the next week. Both weeks it was the same students, the same teachers, and the same schedule they were following. The results on heart rate can be seen in figure 1. Throughout the article, Tiesler et al. point out several interesting findings from the school observations. 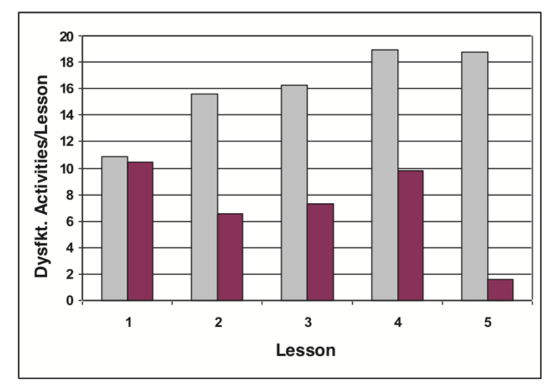 For example, they found that the basic noise levels throughout a five lesson school day differ substantially based on the acoustic environment (figure 2). It is interesting to observe how very good acoustics actually consistently lowers noise levels while bad acoustics just keep raising noise levels throughout the day. Why noise levels rise during a day when exposed to bad acoustics can only be speculated, but Tiesler et al. notes that “[w]ith ‘bad’ acoustics in classrooms, ‘working noise’ will increase because of the ‘Lombard Effect’ and becomes more and more a stressor with increasing fatigue. With ‘very good’ acoustics and when the breaks between lessons are long enough for recreation, there is no increase in SPL” (Tiesler et al., p. 3111). In other words, they argue that the Lombard Effect is to blame for the rising noise levels whereas very good acoustics minimizes the noise levels from the early hours, thereby giving the students fewer noise stressors to recover from, thereby putting the Lombard Effect out of play. Tiesler et al. also argues how ‘very good’ and ‘bad’ acoustics affect the noise levels of different types of teaching (p. 3111) and how proper ventilation further supports recovery from noise stressors (p. 3113). As such, they clearly try to establish a relation between acoustics and both physiological and cognitive health for both students and teachers. It is also worth noting their finding on acoustics and antisocial behaviour which might be another big problem experienced in schools. They try to count the amount of ‘dysfunctional activities’ for the same class with the same teacher under both ‘bad’ and ‘very good’ acoustic conditions. A dysfunctional activity is a weak term but they describe it “like heckling or crying by students” (Tiesler et al., p. 3111). As figure 3 shows, the amount of dysfunctional activities changes drastically during the day depending on the room acoustics. What can we learn from these findings? The authors conclude that improved acoustics will ultimately lead to a less stressful environment which makes possible a positive change in behaviour. This changes the general perception of noise in schools. We often start by trying to teach the children to be quiet and focused thereby minimizing the noise levels. While this is likely to be important, these findings suggest that good acoustics can play a central role in both noise and behaviour control. These findings indicate something interesting that is not always recognized in schools and other learning environments: Acoustics do matter! One might wonder whether there is a direct and proper statistical relation between acoustics and the minimization of dysfunctional activities but all the findings surely indicate that acoustics have a significant impact in both learning and teaching environments. The findings of Tiesler et al. are also supported by other literature. See for example the report Plads til Alle (2011) by Copenhagen county in Denmark where they found that acoustic changes in daycare made a significant difference in the reported stress levels of the employees. Further, Campbell, Brokmann, Vugts & Oorschot-Slaat’s presentation at the Euronoise conference in 2018 provided compelling evidence suggesting problems with noise in learning environments. 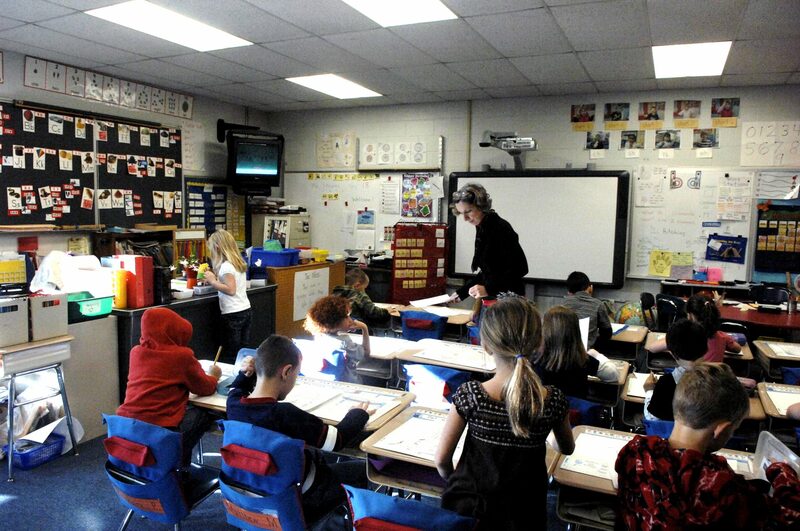 The literature on classroom acoustics are wide and varied and most educators who work with young kids would recognize that noise is occasionally, or often, a problem in their educational situation. Consequently, Tiesler et al.’s findings on both physiological stress, noise levels, and dysfunctional actions in school classes are relevant for opening our eyes to the problems of noise in our societies. Luckily, some schools are already improving their acoustic soundscapes and, hopefully, many more schools will soon realize their need for acoustic planning.